The waterfront of Santa Cruz must be the most relaxing and laid back place in California where hippies are still cool and stress seems an unknown virus. The seals here love it and even though tourists come in crowds to look at them sun bathing they don't really seem to care much. The board walk of Santa Cruz is perfect to go jogging or just have an ice-cream. 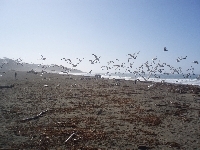 The beach is near Pacific Ave where most people hang out and enjoy the never ending summer breeze. During the day there are so many activities and surf lessons are great here. Cowell Beach is probably the best if you're not that experienced. In the evening you can expect concerts during summer and an overall great vibe in Santa Cruz where people are friendly, interested and really welcoming. There are many nice places to have dinner or drinks and we loved the Gabriella Cafe on Cedar St, just so romantic and intimate. We actually had lunch and dinner there! Their Gabriella Famous Caesar was the best. 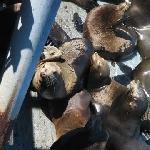 Did you enjoy Seals at Santa Cruz Waterfront and have you been on a holiday in Santa Cruz, United States? Where to stay in Santa Cruz: The Santa Cruz Dream Inn, we did not want to leave!